All SunStar vent-free room heaters feature attractive modern styling with up-to-date safety features like flame-failure protection and an oxygen detection safety-pilot or ODS. And, each model is CSA design-certified to the current national safety standards. These room heaters direct the warmth exactly where you want it! SunStar heaters are virtually 100% energy efficient. Vent-free means no wasted heat. Experience instant heat at startup. Uses inexpensive gas — reduces your electric bill. Works even during power outages. 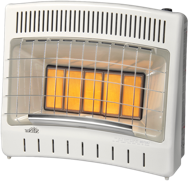 Available with Manual or Thermostat Controls. Propane or Natural Gas Models Available.